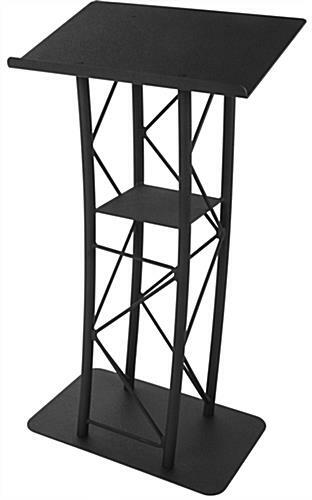 Stands at 45-1/2” Tall, Tabletop is 23-1/2” Wide. Curved Construction for a Modern Design. 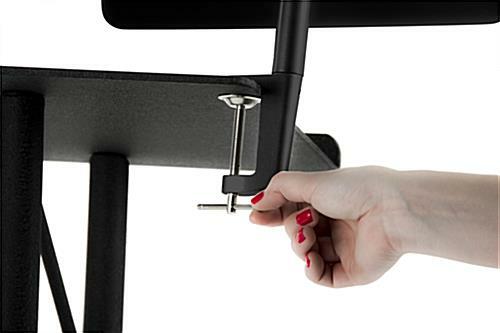 Bracket Clamps to the Edge of Lectern Top. Tilting and Rotating Enclosure for Viewing Adjustments. Locking Enclosure and Hidden Home Button. Fits Apple® Generations 2, 3, & 4. 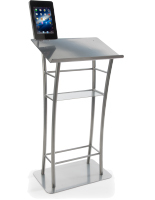 This podium for iPad is the latest and trending design for conferences, conventions, boardrooms, and exhibitions. 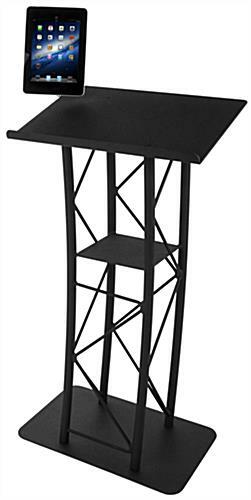 This newer technology is a floor stand with a height of 45-1/2” for the average person’s standing posture and a reading space of 23-1/2” for various notes and literature pieces. 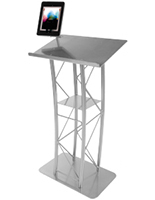 This aluminum podium features a truss design for a more contemporary appeal that engages audiences in high traffic areas such as trade shows. 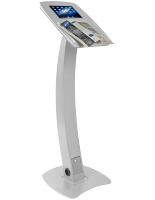 Each lectern is a mount which includes a tablet holder that secures to the side of the tabletop by a fastening clamp. 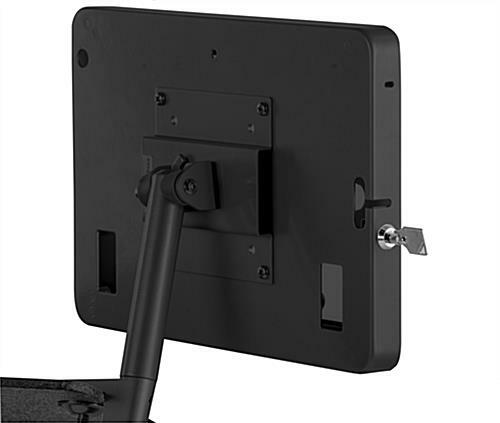 The digital notebook bracket of each podium can tilt and rotate for alternate viewing options and has an exposed home button so users can access all software applications. 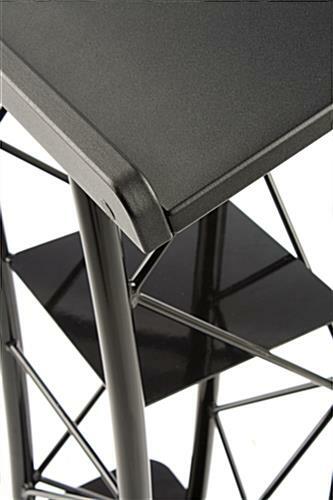 The enclosure is a locking design so that interruptions during presentations, lectures, and demonstrations are prohibited. 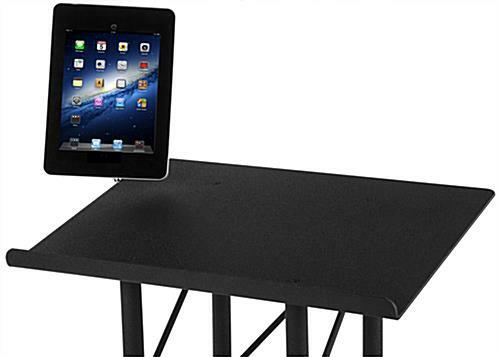 The mount accommodates generations 2, 3, and 4 Apple® devices. 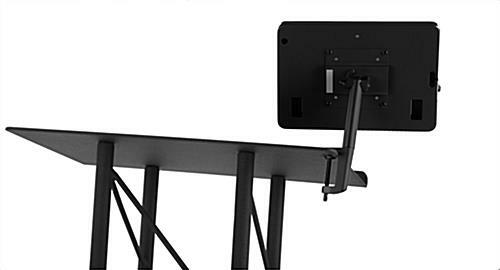 23.8" x 64.0" x 19.0"